New York City summers are brutal and there is a breaking point where you’ve had enough and need to get away. I reached this point on Saturday and knew exactly where to go…Community Table to see our Favorite Chef Joel Viehland and to breath in the fresh country air. 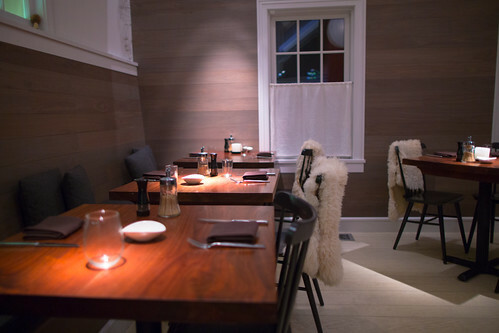 Last April was our first encounter with the Noma Allum and ever since then we have been meaning to go back. Joel’s enthusiasm, talent and vast knowledge of the culinary world helped to push Jose and I into a slightly more obsessed food direction one where the idea of going to Copenhagen for a weekend to check out Noma is perfectly sane. Like the trip to Copenhagen our mini 2hr road trip to Washington CT was well worth it! Speaking of road trips…Joel recently got back from his own culinary trip. This is all from memory, but I believe he went to Noma, Cooked with his buddy Christian Puglisi at Relæ, and went to all of the best restaurants in Paris and various parts of Italy. We knew about this trip and had to see how it inspired his cooking. We also couldn’t wait to pick his brain about the amazing food that he experienced. Our first meal back in April was beyond memorable, it was likely up there with Noma and Geranium as one of the most special dining experiences of the year. That being said we were a bit nervous… can it live up to our expectations the second time around or will it disappoint like MGMT’s last few albums. Thankfully for us Joel is the farthest thing from a one album wonder! This time around we put ourselves in the hands of the master. We asked him to put together a tasting menu of his favorite dishes. Let me tell you, that was the smartest decisions I’ve made in a long time. The first course was the new Anthony Bourdain graphic novel that he plopped with a smile on the table. This thoroughly entertained us until the beautiful assortment of local berries came out to snack on. These berries were gorgeous! Blackberries, Blueberries and Red and White Currants. Each one was perfectly ripe and tangy. This was a nice subtle introduction to some of the flavors we would be experiencing later on in the meal. I love it when a chef thinks holistically!! For our first course, the beautiful Glidden Point oysters from Maine. What he presented was far from typical shucked oyster, instead he brilliantly combined the white currants and dill to make an inventive mignonette. Loved the flavors!! Joel Mentioned that these are his Favorite Oysters. Hearing this made me so excited for these are my favorites as well! When we go home to Maine we tend to go oyster crazy and have them each night. The best thing about this small family run business is their honor system. The family that mans the small shop are often busy pulling up oysters that they can’t be there to help out their customers. Instead of hanging up the “be back in 10 min” sign they leave the door open. It is so refreshing to see an honor system in action…only in Maine =) Glidden point has a variety of different sized oysters and they ship everywhere. You can find their oysters in some great places in the city one of our favs is Masion Premiere. Check out Glidden’s site for more info. A few shots from one of our many visits to Glidden. This dish was INCREDIBLE! It was perhaps one of our favorites of the night and by far some of the best gnocchi I have ever had. No Joke. I think it would be impossible to find a gnocchi of this caliber anywhere in NYC! It’s clear that those days spent eating and exploring in Italy really paid off, for it clearly had an influence on the menu. This dish was more than just good pasta, like the oysters and the bread it showed his level of inventiveness and skill. It may be rude but I am going to have to ask for the recipe for this perfect pasta dish. I was very happy he included this as one of the courses. The duck was perfectly cooked with a skin to die for. Sweet crispy just the way we like it. We could tell Joel had some fun creating this dish. The soup was earthy and creamy. We loved the mix of the sour of the currant and the crispness of the cucumber! Think we will try this one at home. We ended the night with a deliciously rich dessert made by the talented pastry chef April Massey. Her desserts have a slight resemblance to the style done at Noma. That comes as no surprise given the fact that she just came back from a stage there. (We were lucky enough to meet her there in January and are excited that she is back to bring a bit of Noma to us.) We look forward to trying more of April’s desserts in the future! Overall another mind blowing meal! I bet we will be hearing a lot more about Joel in the future. He, without a doubt, deserves that James Beard award! His food has been better than all the winners we have visited in the last couple years. Certainly better than Melissa Kelly’s Primo who won “Best Chef in the Northeast”(here are our pictures from our recent diner link). Let’s see. For those of you who live in NYC, Washington CT it is an easy/beautiful drive. Once you get there there is plenty to do. Lots of great hiking trails and if you like shopping there are some wonderful antique stores in Kent. We highly recommend staying the night if you do go. Please see our previous post for more thoughts on lodging. Wow! Roz told me about your new style and presentation. I have only two words. I am also blown away by Joel’s talents! I am sad that Philadelphia is so far from Washington, CT, but I am making a trip up there at the end of the month and can’t wait!! Great review, by the way, and I love the way you laid it out graphically. This looks fantastic. (I like the alternative of seeing the photos in their flickr format too.) I’d love to know if you managed to find somewhere good to stay the night near Community Table for the trip out of New York? Hey Ben, Thanks for your feedback! As far as hotels and B&Bs go… I would look into the Inn at Kent Falls, Boulders Those are the ones I am familiar with. The Boulders is the closest option. Let me know how your trip and meal is. Hey Ben, yeah we weren’t wowed by stone barn. The night we went the dishes were a bit out o sync and to top it off the couple next to us were obnoxious. 🙂 I have been to his place in the city a while back but perhaps it’s time to check it out with Jose. Maybe we should also give stone barn another chance.